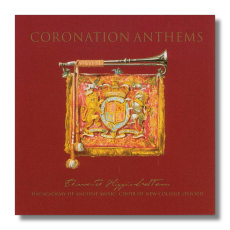 Another of those, 'Coronation Specials', Edward Higginbottom's new Decca disc is a thrilling re-enactment of some of the major coronation music written in the past. The more famous contributions must be Handel's 'My Heart is Inditing' and the inimitable 'Zadok the Priest', a firm favourite with coronation fans. The latter is superbly done here, by using a faster tempo than usual; Higginbottom manages to convey greater thrill and excitement to proceedings. The other items on the programme are also deeply interesting especially Henry Purcell's wonderful, 'My Heart is Inditing', twelve minutes of utter panache and glory written to celebrate the coronation of James I, a Catholic king. William Croft's, 'The Lord is a Sun and A Shield' is definitely the neglected masterpiece with bold sweeping melodies and a glorious conclusion that surely raised the roof in Westminster Abbey when George I was crowned! John Blow also wrote coronation music for William I and his anthem; 'The Lord God is a Sun and Shield' is also very beautiful in its own quiet way. I cannot enthuse more about the beauty of this disc which is splendidly played and interpreted by Higginbottom and the perfectionist AAM. This is the album I would choose out of all the coronation stuff being thrown at us, at least for my money!